DAILY FILM FORUM: MOVIE SPOTLIGHT - "TIME WOUNDS ALL" READY TO ENSLAVE THE SCREEN! MOVIE SPOTLIGHT - "TIME WOUNDS ALL" READY TO ENSLAVE THE SCREEN! 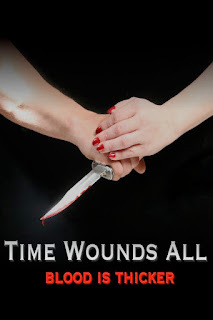 Production is announced today from MM Mayhem Films for the new Horror / Psychological Thriller feature film "Time Wounds All. "From the mind of Nicholas Boise ("A Fight For Survival","Awake in the Woods") and the ink of Jessi Boise comes one of the most mind bending tales to ever take the screen. Lead by Award Winning Actor Keith Collins ("The Meat Puppet", "Clean Cut") who is set to captivate and confuse you as you try to figure out the secrets hidden in within the darkest depths of our minds. "Time Wounds All" will keep you guessing until the end. "Time Wounds All" tells the story of Inside every family there are secrets. Some good and some so dark that every member must work to keep it. Elizabeth and Eddie Williams live on their childhood farm with their brother Evan. When a forgotten skeleton escapes it's closet and threatens their perfect life, someone must take charge! What is this family hiding? And who are they hiding it from? In the end one question is left unanswered...Is it fear that makes you guilty; or is it that you fear you're already guilty? STARRING: Keith Collins ("The Meat Puppet", "Clean Cut"), Elana Mugdan ("Let's Make A Movie","Letters To Quentin"), Francesca DiPaola ("Lifetime's - The Sisterhood"). Produced by, Nicholas Boise ("Awake in the Woods"), Keith Collins. Directed by, Nicholas Boise. Written by Jessi Boise & Nicholas Boise.